David and I have eaten our fair share of animal parts–liver, sweetbreads, ears, etc. Perhaps one of the more pleasant surprises I had in sampling something a little off-the-beaten path was roasted bone marrow. Our love for this dish arises from our favourite Vancouver restaurant, Le Crocodile, where we both had the chance to try bone marrow for the first time. I had no preconception about what marrow would taste like, and I’m pleased to report that it’s buttery, creamy, melt-in-your-mouth delicious (“bone butter” as David calls it). We were able to procure a pair of bones on a recent trip to renowned butcher in town (the Butcher Larder) and were stoked to try our hand at roasting them. Preheat oven to 450 F. Put bones, cut side up, on foil-lined baking sheet or in ovenproof skillet. In a small bowl, mix together garlic, thyme, salt and pepper. 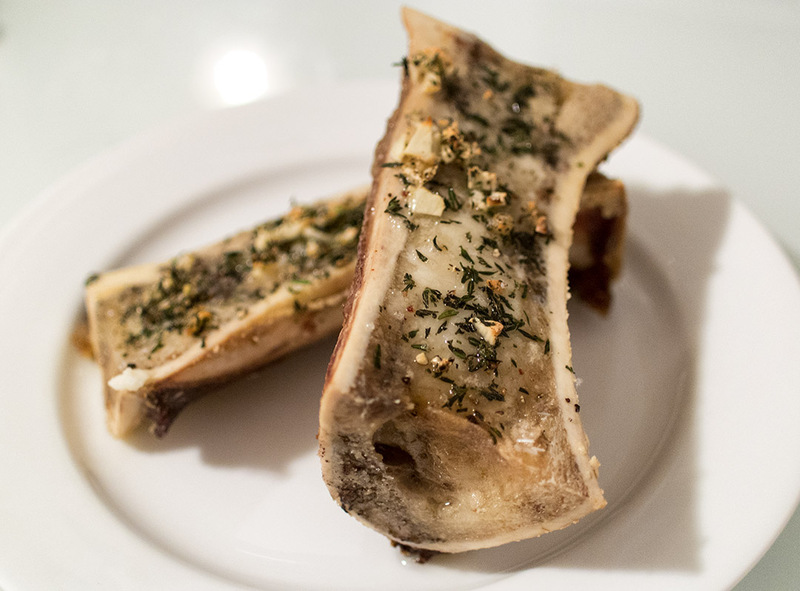 Bake bones until marrow is soft and has begun to separate from the bone, about 15-20 minutes (stop before marrow begins to drizzle out). Approximately, half-way through the baking time, sprinkle the garlic mixture over top of the cut halves. This dish was shockingly easy to make and every bit as a scrumptious as the oven-roasted beef bone marrow appetizer we’ve frequently ordered at Le Crocodile in Vancouver. It had the same deliciously buttery texture and was great spread over toast or a baguette. Since we purchased 2 bones (4 halves), we actually made this dish on two separate occasions. The first time we only had sandwich bread on hand, so we were a little let down by the unawesomeness of the bread. Nonetheless, the marrow shone through! I could just eat it with a spoon scooped straight of the bone and would be happy. Definitely one to make again. And again.